New York, NY — The late Norman Miller, born Norair Deirmengian on the eve of the Armenian genocide, was a master of doors. Early in his career, he developed the first electrically activated safety edge for hangar doors. Word spread quickly through the U.S. military, and strategic air command bases around the world began purchasing them. Soon after, Norman was awarded the first of many U.S. patents that he received over this long and successful life. So the “full circle” irony hasn’t been lost when one considers how a man whose career revolved around doors is the same one opening doors for Armenia’s and Karabakh’s future engineers—through the Norman Miller Scholarship Fund. Mr. Miller passed away in 2009 at the age of 94, survived by his wife Virginia, his five children and 10 grandchildren. His awe-inspiring transcontinental life story is one of open doors leading to other open doors. In this way, he could rise from the ashes of the 1915 genocide to become the embodiment of the American Dream—as an entrepreneur, inventor, businessman, patriot and philanthropist. After settling in Philadelphia, graduating from the University of Pennsylvania business school, serving in World War II – while still not yet a citizen — Mr. Miller eventually wound up owning his own company Miller Edge. His company began manufacturing safety products for the overhead door industry. The business grew to expand its product line to include edge sensors for industrial and commercial doors and motorized gates. In the 1970’s, Norman transformed the sensing technology by adding pressure sensitive floor mats to protect robotic work cells as well as smaller touch-sensitive strips for machinery pinch point protection and door edges for transit vehicles. These successes equipped Norman with the resources and ability to help others open new doors to opportunities and reach their full potential, the way he was able too. Armenia was fertile ground to make this dream come true. “We are truly grateful for this opportunity to make a difference in the lives of youth through his higher education scholarship program, endowed by Mr. Miller’s family foundation. With this initiative, young engineering students will be motivated and inspired by Norman’s own life story and how he used his successes to help change lives,“ remarked Irina Lazarian, executive director of Armenia Fund USA. The scholarship isn’t the only legacy that Mr. Miller has left to his ancestral homeland. A few years back, he was as instrumental in bringing clean potable water to the village of Nor Getashan, located in war-torn Karabakh. Thanks to his funding of a new water delivery system, villagers could put away their buckets used for carrying well water and enjoy drinking water right in their own homes as well as at the town’s school. Prior to that, Mr. Miller found a most inventive mission by which to help the victims of the 1988 Armenian Earthquake. 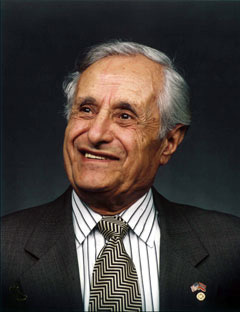 He spearheaded a collection of copiers and fax machines, had them refurbished and repaired in the warehouse of his company, packed them with donated clothing as cushioning, and shipped them to Armenia. Norman believed that if the people could see how communications could be a door leading out of the devastation, they could help themselves recover. It is also fitting that Armenia Fund would be chosen to administer the scholarship, given that engineering plays such a critical role in practically every infrastructure project it has undertaken over the past 20 years—from highways, reservoirs and pipelines to electronic networks, indoor plumbing, agricultural machinery, farming equipment and more. “Building a nation that is built to last requires an army of engineers, not only with the professional credentials but also a deep understanding of their country, its society, and the challenges it is up against. Native Armenians can do this in ways that no other outside engineer really could. Without such engineers working with us on the ground, many of our projects would not get off the drawing board,“ Ms. Lazarian noted. Meeting with the student-beneficiaries, 2012. Another reason why the scholarship is so critical is that when Armenia became independent, the introduction of a tuition-based system in colleges and universities often made higher education unaffordable for distinguished high school graduates. As the scholarship will grant funds to students with exceptional qualities, it will help level the playing field so that talent and ambition will not be thwarted by financial constraints. In addition to the candidate not benefiting from any tuition free education system, he or she is required to be enrolled full-time in a qualified technical or engineering high school academy, college or university in the regions of Gyumri, Vanadzor or Artsakh, as the starting points. They are also to meet academic subject grade requirements. Once those criteria are met, preference is given to students who may also reside in border villages, are orphans or children of single-parent households or foster homes, have a physical disability, are actively involved in student life or have proven leadership and organizational skills through involvement in extracurricular and service-based volunteer activities. A seven-member commission, formed at the discretion of the Hayastan All-Armenian Fund Executive Director, decides the allocation of funds and the final recipients. “All we ask in return is that the student acknowledge and accept the Foundation’s conditions and assume moral obligation to assist needy students in the future, if ever in a position to do so, “stated Ms. Lazarian. “We encourage these students to try to exemplify Mr. Miller’s own advice: ‘Education is never ending. Always strive to better yourself and use your knowledge to help improve the lives of those around you’. We hope these students will aim higher in everything they do, aspiring for the exceptional,” she added. Surely, the story of Norman Miller will inspire these students to help turn Armenia and Karabakh into powerhouses of engineering expertise—producing world-class professionals involved in challenging and rewarding work right in their own communities.